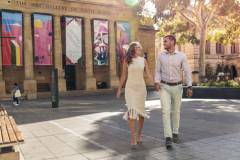 - For Market Culture, tour departs from the entrance of Hilton Adelaide, Victoria Square. - For Classic Adelaide - Culture and Heritage, tour departs form South Australian Tourism Commission building, 121 King William Street, Adelaide. - For East End Pub Culture, tour departs from East Terrace Continental Cafe, 6 East Terrace, Adelaide. - For West End Art and Culture, tour departs from Higher Ground, 9 Light Square, Adelaide. - Casual meal (ie.breakfast, lunch with a glass of wine, morning tea or afternoon tea). - Local guide and entrance fees. - Inclusions may vary depending on the time of the day the tour is taken. - There are 4 choices of theme walks available for this 4 Hour Insiders Adelaide: Market Culture, Classic Adelaide - Culture and Heritage, East End Pub Culture and West End Art and Culture. Passengers need to advise which walk they are interested at time of booking. Departure point may vary depending on the tour chosen.